The ‘Easi Build 80m Transceiver’ was designed by Bruce Edwards G3WCE and published as a series of ‘Down to Earth’ articles in RadCom in July-Nov 1999 and Jan 2000. It is a CW QRP direct conversion receiver based on an NE612, with VFO and RIT, and a transmitter capable of around a couple of watts, with a sidetone oscillator. The design as presented is a single band transceiver, with manual switching between transmit and receive. It is, as its name suggests, easy to build. After a long hiatus, I’ve returned to ham radio and CW, getting up to a CW speed of 12/14 WPM, and constructing an Arduino-based Antenna Analyser (moderately successful, could be improved) and a RockMite ][ kit for 20m. I’ve been re-studying my RAE electronics, and QRP construction articles, but am not yet at the stage where I could completely design a transceiver from scratch. The original was a single band transceiver, whereas I want to be able to switch between a small number of bands. I’ve chosen 40m, 30m and 20m as the ones I’ll build for, but the filters will be pluggable, and I’ll provide design/construction notes for all the UK amateur HF bands. The single VFO of the original will be replaced by an Arduino Micro-controlled AD9850 Direct Digital Synthesis module, as used previously in my build of Beric Dunn’s antenna analyser. This, with a buffer, will hopefully yield all HF bands. I’ll control the switching of filters via relays, driven by the Arduino. Manual switching between transmit and receive is also going to be controlled by the Arduino, with the addition of a keyer, and support for paddles as well as straight keys. The RIT and sidetone generation will also be handled by the Arduino. 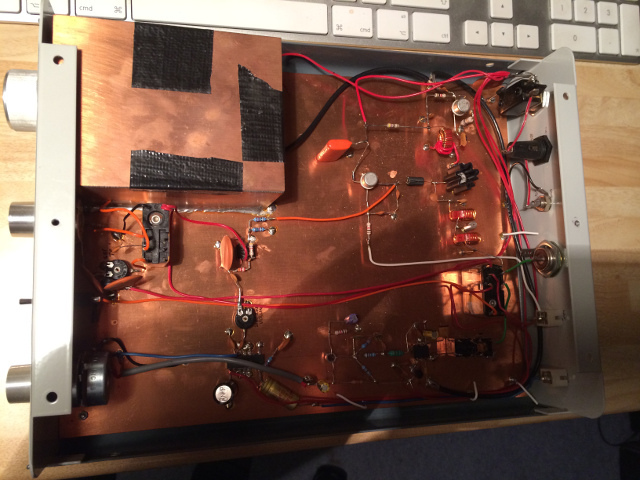 The audio output stage will be replaced with a narrow CW filter and amplifier, using the NM0S Hi-Per-Mite circuit. I plan to document the project via this blog, in a series of articles, each on a separate aspect of the transceiver. I hope each article will be of ‘magazine quality’ – I don’t want to waste your time with failed experiments, although I am a very amateur amateur, so it’s likely there will be some reworking… as I proceed, I’ll be writing a construction guide that can be taken as a stand-alone guide to building your own EasiBuild Mk 2. I’ll provide design notes, schematics, parts lists, test instructions along the way. You don’t need to have the original articles at hand – I’ll quote Bruce (and others) along the way. Without Bruce Edwards G3WCE’s original articles, this project would not exist (or would be very different) – in his conclusion, he writes “With a reasonable antenna (e.g. a G5RV) you shouldn’t have any shortage of QSO’s.” Let’s see! Thanks to Maidstone YMCA Amateur Radio Society for advice and components. Two online communities have been very supportive and helpful: The Facebook “Ham Radio Homebrew Corner” group for much advice on the project. The Twitter @lids_cw “Less Involved Data Society”, for encouraging QRP and QRS – especially Michael G0POT and David G7AGI for advice; David introduced me to the Hi-Per-Mite filter – many thanks! Also Dennis Anderson of Kanga Products, for advice on components, and supplying the excellent RockMite and K14 keyer kits. Stay tuned for the next exciting article!